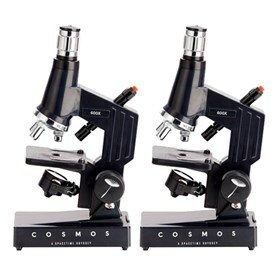 The Celestron 44127 is a Cosmos biological microscope kit that comes with everything needed to start viewing the microscopic world right out of the box. This kit includes monocular microscope that features a 10-20x zoom eyepiece, three glass objective lenses, dual illumination, and specimen stage with metal stage clips. The three objectives and zoom eyepiece are capable of producing a broad magnification range—from 40x to 600x. In addition to the microscope, this kit comes with prepared slides, blank slides, light diffuser, and several tools for preparing your own specimens. The Celestron 44127 2-Pack has many exciting features for users of all types. See the Celestron 44127 2-Pack gallery images above for more product views. The Celestron 44127 2-Pack is sold as a Brand New Unopened Item.